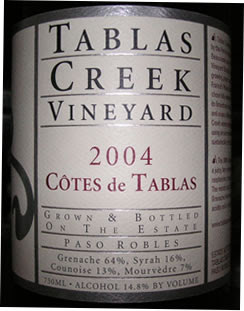 This week's wine is Tablas Creek's less expensive Rhone varietal blend (the Esprit de Beaucastel is the primo version), composed of 64% Grenache, 16% Syrah, 13% Counoise and 7% Mourvedre. It was purchased from the winery and set me back $17.60. Very nice aromas of smoked, peppered meats, bacon, rose petals, and raspberry jam. On the palate I noted berries, minerals, spice and a peppered cranberry finish. This wine had a silky mouth feel but a bit of a tannic bite at the end. I was sad to drink the last drop. Two thumbs up for this wine and I'd say very good QPR, too. Below is my YouTube choice to accompany this wine. If the video isn't visible, click here.